Many notable supporters of Palestinian rights from around the world gathered in New York on June 29, for the first day of a UN-sponsored, two-day conference held to discuss Israel’s 50-year-long occupation of the West Bank (including East Jerusalem) and Gaza– and what can be done to end that occupation. The eight speakers on the first day were more at the official or semi-official end of the spectrum. They included Palestinian negotiator Saeb Erakat; former Israeli foreign minister Shlomo Ben-Ami; the UN’s former coordinator for the Middle East Peace Processor Robert Serry. 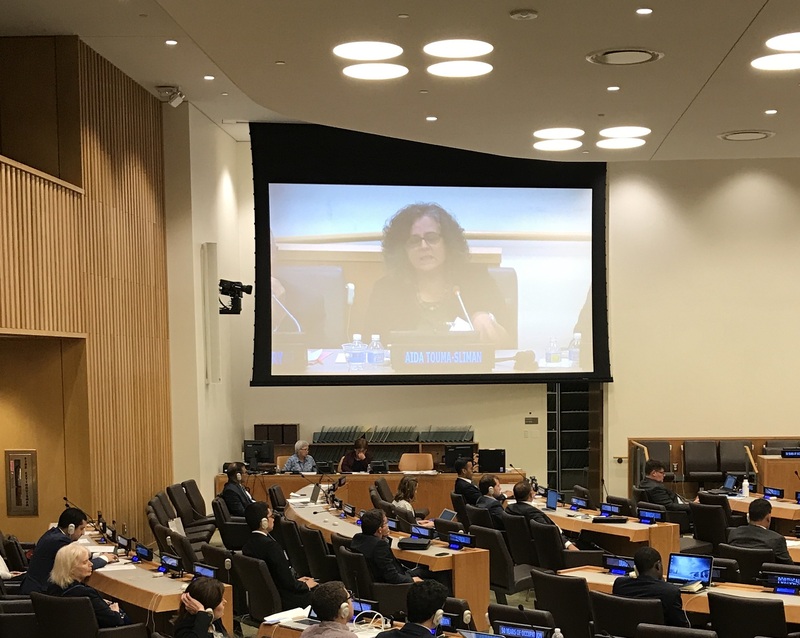 The gathering, held in one of the large, well-appointed conference halls hidden in the basement of the UN building, was launched with the reading of messages from Secretary-General Antonio Guterrez and representatives of several other intergovernmental organizations, and governments. But soon enough it became more lively as the speakers and attendees speaking from the floor of the hall jousted over issues such as: whether it was any use for the Palestinian leadership to put so much reliance on what looks like an endless, unsatisfactory “peace process”; what should be done about Gaza; whether there is still any hope for the “two-state solution”; and whether the United Nations itself had been at all helpful in securing Palestinian rights. Saeb Erakat was the first speaker. He read out a message from Palestinian President Mahmoud Abbas that started off by saying baldly, “I wish this meeting had not taken place”– that is, that the occupation had not lasted long enough to justify a conference marking its half-century. Next up was the high-ranking former Egyptian diplomat, Nabil Elaraby. He called straighforwardly for the full-scale implementation of the UN Security Council Resolutions 242 (1967) and 338 (1973), which both stress the inadmissibility of the acquisition of territory by force. “Getting into other issues like swapping this piece of land for that piece is not needed. We need implementation,” he stressed. In his opening remarks, Shlomo Ben-Ami commented that the war of 1967 had brought Israel “military grandeur but moral collapse.” Ben-Ami had been foreign minister in the brieg government that the Labour Party’s Ehud Barak led, 2000-01. He spoke about how he saw the 1967 war and the military occupation that came in its train had also brought about the continued growth of rightwing religious forces in Israeli politics. “We have had a rise in ‘ethnic’ nationalism and a stress on Jewishness, not Israeliness,” he said. Ben-Ami was harsh, however, in criticizing the BDS (Boycott, Divestment, and Sanctions) movement in support of Palestinian rights, arguing that it had given Netanyahu something to mobilize against. He also used another tack to argue against BDS, claiming that it had anyway been very unsuccessful since Israel’s trade relationships with many countries that formerly boycotted Israel such as China, India, and Japan were now massive. Hassan powerfully and very movingly described the plight of the two million Palestinians in Gaza, speaking for a while “as if” she were a young Palestinian in Gaza who had already lived through three fierce Israeli military attacks and ten years of siege and was now facing the extreme curtailment of their electricity supply, with no hope of an end in sight. Serry also spoke of the strong need to overcome internal Palestinian disagreements and not to marginalize Gaza. Galia Golan-Gild of Israel’s Meretz spoke next. 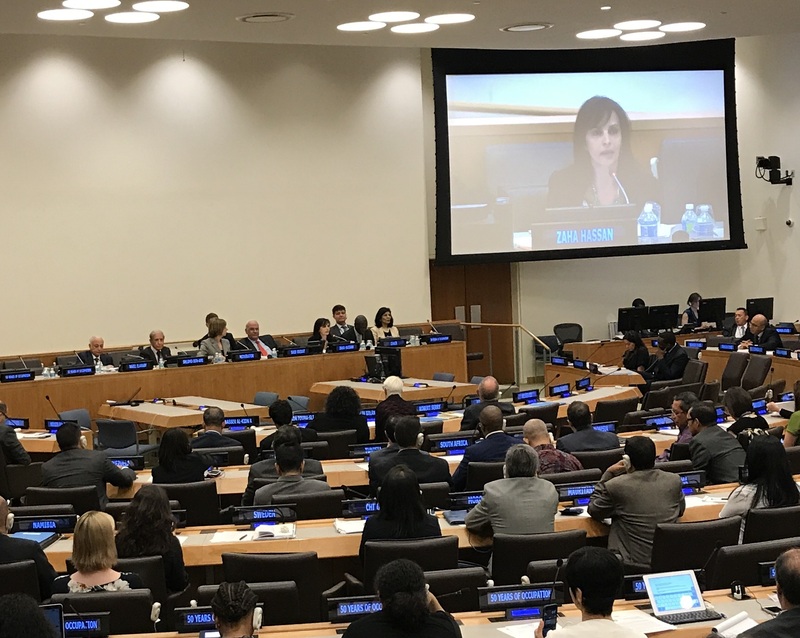 She lauded the decision the PLO had taken in 1988 to recognize Israel and called for the full and speedy implementation of Security Council Resolution 2334. That was the resolution passed in late December 2016 in which the Security Council restated its long-held view that Israeli settlements in the occupied territories “including East Jerusalem” constitute a flagrant violation of international law, demanding that Israel stop such activities. The United States had abstained from voting on 2334, which allowed it to pass. That abstention, coming in the last days of the Obama administration, aroused the criticism of Israel, U.S. Republicans, and other supporters of Israel, who said it was very unfair to Israel– and of many progressive voices in the United States and around the world, who said this tepid endorsement of the international-law position on settlements by the Obama administration was really far too little, far too late. Golan-Gild hewed much more closely to the longstanding Israeli policy on the Palestinians’ Right of return than she did on resolution 2334, warning about the fears that a full-scale implementation of this right by Palestinians would swamp Israel with Palestinian returnees. Golan-Gild was followed by Aida Touma-Sliman, a Member of Knesset from the Palestinian-Israeli “Joint List”. “I don’t see that you can have a Zionist ‘left’,” she said, “especially when we see these ‘left’ Zionists refusing in their coalition-making to be reliant on the parties of the Palestinian citizens of Israel. We are 20% of the citizens of Israel! We want peace so much. But if the peace movement wants to cut us out, there will be no deal– if there still is a peace movement in Israel. The longstanding Palestinian diplomat Nasser al-Kidwa had been invited to the conference but was reportedly unable to get a visa from the United States to be present. In his stead, the current PLO Ambassador to the U.N., Riad Mansour, spoke instead. This panel then saw some lively interventions from members of the audience, including from Nobel Peace Laureate Jody Williams, Palestinian nonviolence leader Iyad Buran, and Palestinian-American community leader Lamees Dik. Burnat’s intervention was particularly moving. He told the conferees that one of his sons had been shot the day before, by the Israeli “security” forces, in their home village of Bil’in, in the West Bank; and he pled with the panelists to work to end the occupation as speedily as possible. The conference continues today, with a keynote speech from Jody Williams and then three panels featuring an array of civil-society activists and leaders.